Sometimes life is full of weird coincidences. I picked up this book on Monday, intending to read it throughout the week and have it done and ready to review by today. Of course, being me, that didn’t work out and I ended up reading the majority of it yesterday, but I did start it Monday, which to me means that it’s this week’s book, come hell or high water. It’s not rational but there you have it. So when I got the news that Jerry Doyle, the author’s co-star from Babylon 5, passed away this week, I was wondering how tasteful it would be to still review this book. I decided that it was fine. It’d be different if the person who’d passed were the author himself. I probably would have put the book aside at that point. Since that’s not what happened, here we go. The other weird coincidence also has to do with the authorship of this book. Yeah, it’s got Bruce Boxleitner’s name on the front. This book will not let you forget that. Ace Books really played up the B5 connection here. In case you’re wondering, the entire back of the book is a picture of The Bruce, in uniform, and with that tiny amount of jacket copy floating under him. But I’ve read books by sci-fi television actors before, and I’m about ninety percent sure that the only one of them who wrote their own book was Walter Koenig. I wondered for a while who ghostwrote this for BB and so I had to do a little research. Remembering that William Shatner gave special thanks to Ron Goulart for his “help,” that was the first place I looked. Bruce thanked Ed Gorman and Bill Keith. So I set about doing some research. And that’s probably our answer. I’m not sure what Gorman did, but it would appear that Keith wrote this book. Although, to be fair, this is the only reference to William Keith being the ghostwriter I could find. 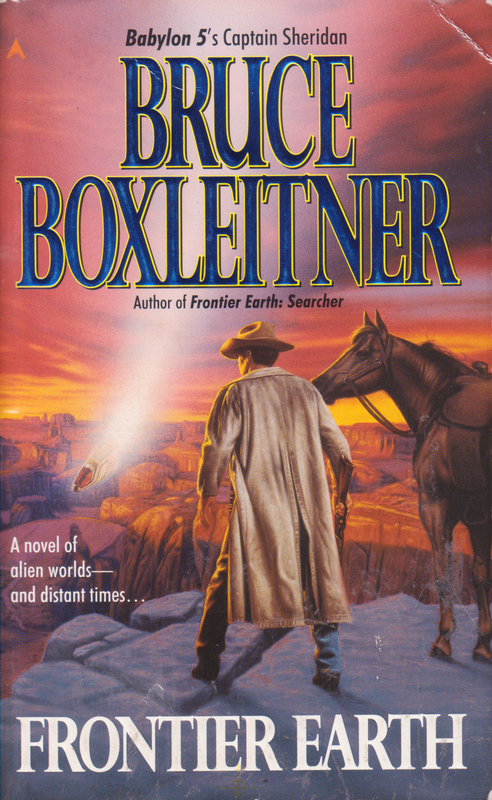 The answer to how much of this book was Boxleitner’s might still be up in the air. Most of the reason I bring this up is that, under the pseudonym Robert Cain, William Keith also wrote the Cybernarc series. The dude got around. So how does Frontier Earth stack up? It’s not that bad. Definitely not great. I have a few things to complain about but on the whole this book was readable and enjoyable. The main thing going on is that our hero, Macklin, is an alien that crashed onto the planet Earth in 1881. He’s human-looking. The only things that set him apart from other humans are his incredible skills and the round black thing set in his chest. He’s also got amnesia. When measurements are used without any kind of context. How the hell am I supposed to care that the villains are nine bigflarps away when I don’t know what a bigflarp is? Everything else is being translated for us anyway. The protagonists are either speaking English somehow or their dialog is being rendered into English for our benefit. So why are those words not translated for us, too? What’s it matter if the spaceship landed 4.5 zinquits away, or about a mile? Our hero wakes up after his crash, gets found by some folks, and keeps repeating the word “Ma’khleen,” so everybody figures his name is Macklin. Macklin spends most of the book trying to figure out who he is, what he’s for, what the thing in his chest is, and sundry things of that nature. Alongside this story we get the tale of the Kra’agh. They are the bad aliens. I never got a clear mental picture of them but I think they’re like furry giant centipedes. They eat people and they’re also able to project images to help them blend in with their surroundings, so they can be a rock or a tree or a human or something. Their whole purpose on this planet is to advance scout it out for their people, who we later learn are the kinds of aliens who show up on a planet, exhaust its resources, and then move on to another one. In case you’re not convinced they’re evil yet, these two characters are named Deathstalker and Painspinner. They are from Planet Subtlety. I don’t know what that was supposed to show us, but what it communicated to me is that this is another story where the humans win because the alien invaders are dolts. Oh, and the other thing that got me about these aliens is that whenever the narrative was from their point of view, it was entirely in italics. I don’t know how I feel about it other than I don’t think it’s necessary. And then there’s the third plotline of this book, the one that takes up the majority of the 322 page text. That story, my friends, is the Gunfight at the O.K. Corral. What I’m saying here is that most of this book is a straightforward historical fiction text where we get to learn about the famous showdown of the Clantons and the Earps and all of the many things that led up to it. And you know what? This book was pretty damned good at that. I love studying history, but I have to admit that the Old West is one of my weaker areas of knowledge. That said, I felt like Boxleitner or Keith or whoever wrote this book did a lot of research about the events depicted in this book. He got the feeling right, for one thing, but also he did a good job of making sure that neither side of that Famous Argument was depicted as entirely good or entirely bad. Boxleitner/Keith presented that showdown and the events leading up to it as a clash of cultures, the Cowboys, Democrats from the south who took great pride in their freedom, versus the Law, northerner Republicans who were trying to bring civilization to the West. The narrative was sympathetic to both parties and was rendered quite accurately, based on the smidgen of research I did after reading the book. I was impressed as all hell. But what this means is that this book is Gunfight at the O.K. Corral and Aliens. That leaves a bad taste in my mouth. To be fair, though, what this book has above that rash of books like Pride and Prejudice and Zombies or Sexual Behavior in the Human Male and Zombies or Little House on the Zombies is that this book was actually written by somebody as opposed to copy/pasted into a Word document with a few extra paragraphs lazily added in. God, I hate those books. I don’t hate this book. But one thing you can do to get the majority of the plot of this book is read the Wikipedia page on The Gunfight. It’s a helluva story. Macklin and Doris are members of something that’s not called Starfleet and is a part of something not called The Federation. They’re here to stop the Kra’agh from taking over Earth. One thing I liked: Doris mentions that she and Macklin don’t just look like humans, they are human. They’d have to be to fit in, since the likelihood that any two intelligent species would look anything like each other is infinitesimal. Thank you, book, for addressing that. They’re actually descendents of humans who were abducted about three hundred years ago from Roanoke. I started to wonder if this book would diverge from our history when one of the Kra’agh, disguised as some human farmer guy, showed up at the O.K. Corral with a rifle and proposed to help the Clantons win by hiding in a nearby loft and ambushing the Earps. Macklin showed up and put a stop to that, though. Oh, did you folks know that the famous Gunfight didn’t actually take place at the O.K. Corral, but in an empty lot nearby it? I didn’t know that, but whoever wrote this book did! Good job, author! Damn fine research! The Kra’agh runs off, severely wounded. Macklin chases it into the desert. Its cohort kidnaps Sarah, whom Macklin was pretty fond of although he never boned her. He did get some bone on in this book, though. It was all from Doris. I don’t know how far it went, but he most definitely got a beej. My ability to follow the narrative started to break down around here, but I think that was because I was tired. One way or another, Macklin stops the Kra’agh and saves Sarah. Unfortunately, this means he wasn’t able to meet Doris at the spaceship at an appointed time, so she left the planet without him. It’s okay, though, because they have a contact in Tuscon, and that contact will provide him the things he needs to complete his mission. The last thing to happen in the book is that one of the Kra’agh—I don’t remember if the other one survived—meets an Apache in the desert. Said Apache, unlike everyone else, isn’t scared of the alien. In fact, he thinks he’s a spirit of some sort and reveres him. This gives the Kra’agh something to think about, mainly about how humans are just plain weird, as he finds his ship and heads back to the main Kra’agh fleet. There’s a sequel to this book and I own it and will read it. The main thing I want to take away from this book was that it was a competent western and an even better fictional recounting of actual historical events. Like I said, the majority of this book was just about the Clantons and the Earps and their hatred of one another, and that was okay. The sci-fi element took a backseat to all this, and was pretty standard material. It was inoffensive. It was very nineties in a way I can’t quite put my finger on. It’s just a feeling bubbling there beneath the surface. A lot of things came together to make the nineties what they were. The book did try to tie together the idea that both of the conflicts in this book were Culture Clashes, but that didn’t gel quite as well as it probably should have. Yeah, I get the idea when it comes to the whole Clanton/Earp thing, but when it comes down to the sci-fi plot, I fail to find sympathy with the giant centipedes who eat people and steal their images and revel in their pain. I’m curious if anybody knows the story of how this book was written. How much work did Boxleitner put into it? Was it just his idea? Did he outline it? How much of it did he write? Am I being unfair in my feeling that William Keith wrote the whole thing and then Ace Books slapped Tron’s name on it to sell more copies? I think it’s funny that the book’s sequel is advertised on the front of the book as an “also written by.” It made me stop and wonder which book was supposed to come first. I’m pretty sure I picked the right one. William H Keith certainly wrote this. See his website. He also writes under many pseudonyms, currently using Ian Douglas for space opera books. He was a navy corpsman and is a Mensa member, so certainly a smart man with an interesting background. He has a tendency to re-use ideas too often in his work but is under appreciated, I think.